Uriah Tracy was an attorney and politician who took up arms against the British after the Battles of Lexington and Concord. Following his military service, he served Connecticut locally as an attorney and nationally as a senator in Washington, DC, for 11 years. Tracy was born in Franklin, Connecticut, on February 2, 1755. The son of Eliphalet and Lucy Sarah Tracy, Uriah, at the age of 20, marched to Boston in response to the alarm raised by the colonial skirmish with British soldiers on the Lexington Green. After helping force the British to evacuate from Boston, he returned to Connecticut, graduated from Yale College in 1778, and then attended the Litchfield Law School—being admitted to the bar in 1781. He opened a law practice in Litchfield and, the following year, married Susannah Bull. Together, they had five children. An ardent Federalist (one who advocated for a strong national government), Tracy soon involved himself in local politics. He became a member of the state general assembly in 1788—serving for 5 years (the last as Speaker). His move onto the national stage came with an election to Congress in 1793. 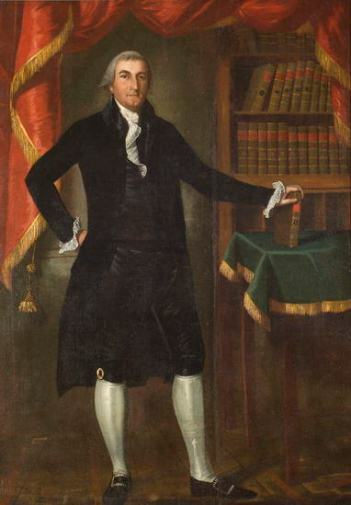 He held this post until 1796, when the state of Connecticut chose him to fill the Senate vacancy created by the resignation of Jonathan Trumbull. As a senator, Tracy played a very active role in national politics. He served on several committees and eventually became president pro tempore in the Senate. In December of 1803, he formed a committee to consider action against impeached Judge John Pickering of New Hampshire. While serving as chairman of the committee, Tracy helped author the set of rules and regulations used for holding an impeachment trial. He served in the Senate for 11 years, right up until his death in Washington on July 19, 1807. In recognition of his contributions to the nation, Tracy became the first senator buried in the Congressional Cemetery. “Uriah Tracy (1755-1807).” Biographical Directory of the United States Congress, 2016. Link. “Finding Aid to the Tracy Family Papers, from 1794-1937.” Yale University Library,Manuscripts and Archives, Sterling Memorial Library, 2016. Link. “Litchfield Ledger - Uriah Tracy.” Litchfield Historical Society, 2016. Link. “Portrait of Uriah Tracy.” Litchfield Historical Society, 2016. Link.